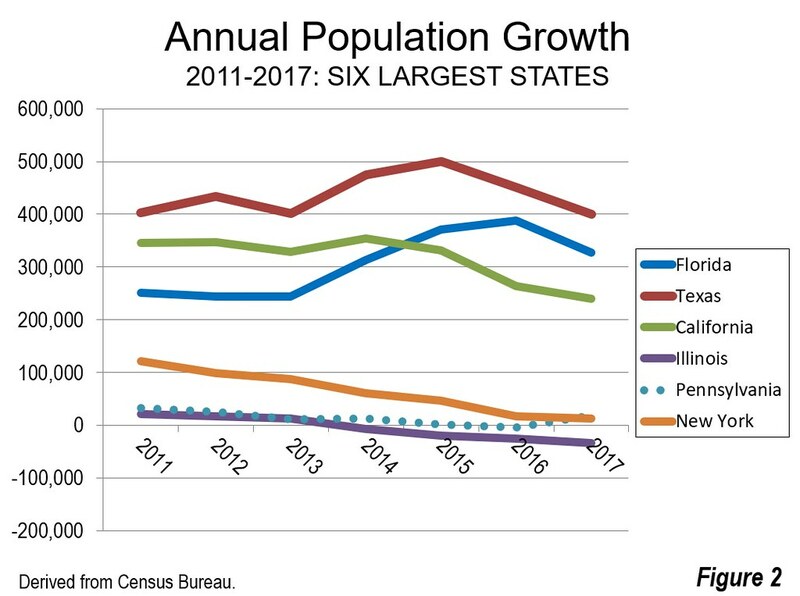 Over this decade, the three largest states have dominated numeric population growth. 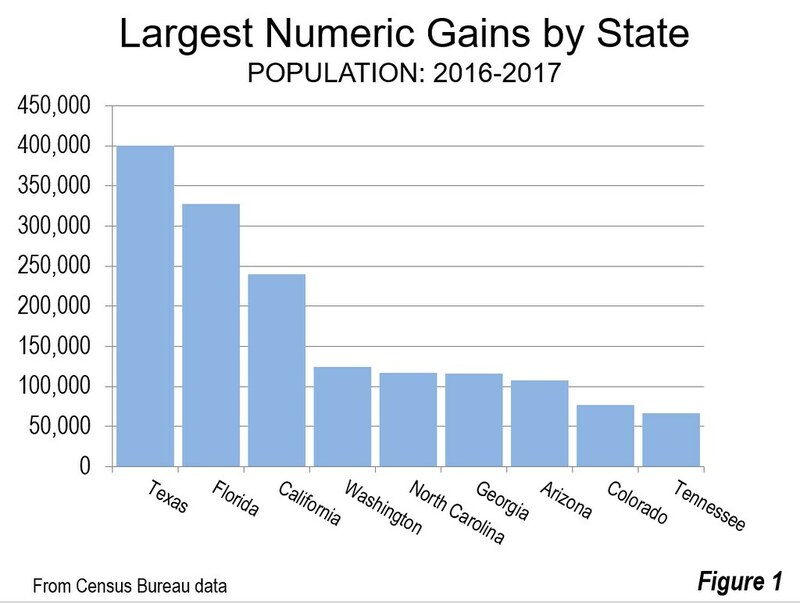 Texas has led the nation in each of the seven years, though has experienced declines in growth over the last two due likely to the instability in petroleum markets. Since 2010, Texas has added 3.1 million residents, more than live in 18 states and the District of Columbia. California has added 2.2 million new residents since 2010, edging out Florida. California’s growth, however, has dropped significantly, to 240,000 between 2016 and 2017 the smallest number since the late 1990s. California’s growth in this decade had peaked in 2014 at more than 350,000, but has since dropped by nearly one quarter. Florida added 2.1 million new residents and has led California in each of the last three years. Illinois Drops a Notch: Further, Illinois in 2017 lost its long standing hold on the fifth-largest position to Pennsylvania. Pennsylvania’s ascendancy reverses a development in the 1950s, when Illinois passed Pennsylvania to become the third largest state. Less than a decade earlier, Pennsylvania had been passed by California, relinquishing its second ranking, which it had held since the 1810 census. Later, Illinois had been passed in the 1970s by Texas and in the following decade by Florida. (Figure 2). 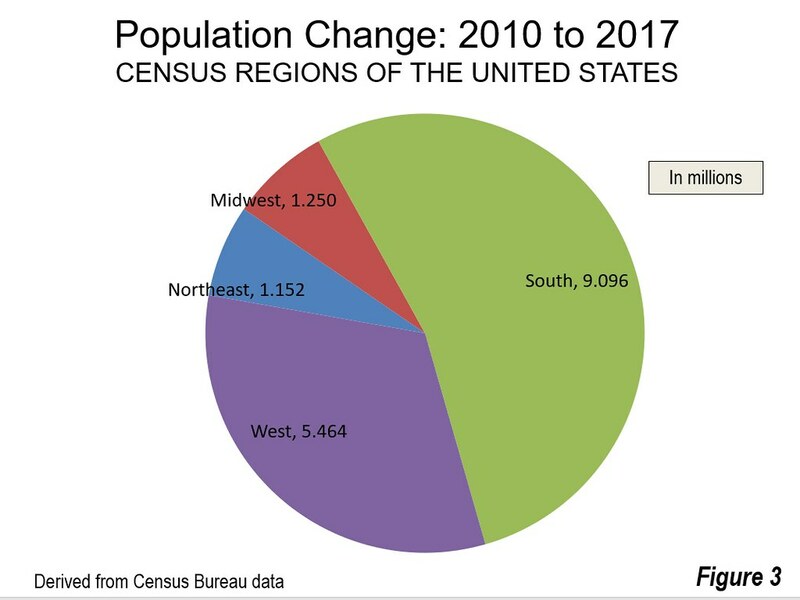 The latest population estimates indicate that the long-term movement to the South and West is continuing. Of course, the biggest exception in the West remains its largest state, California, which has become one of the nation’s largest exporters of people since the 1990s. 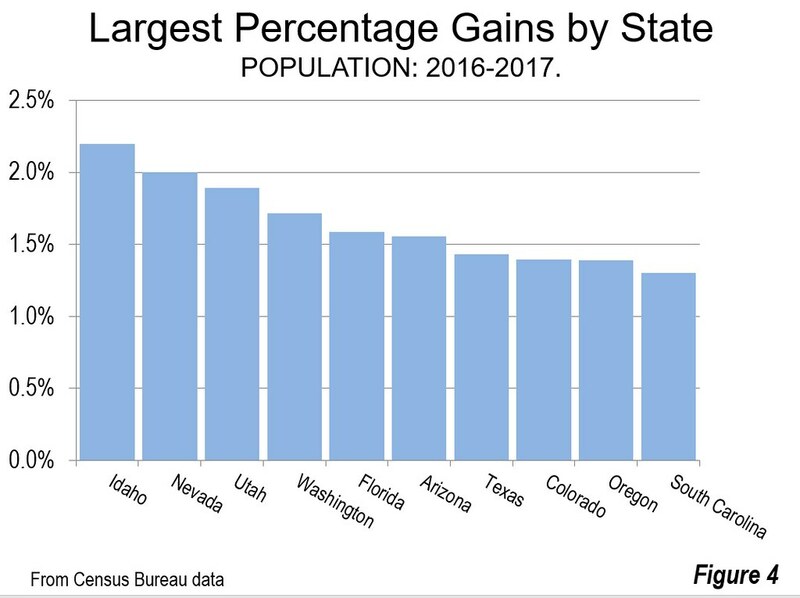 In contrast, Arizona, Washington, Colorado, Oregon, Nevada have attracted large numbers of people. 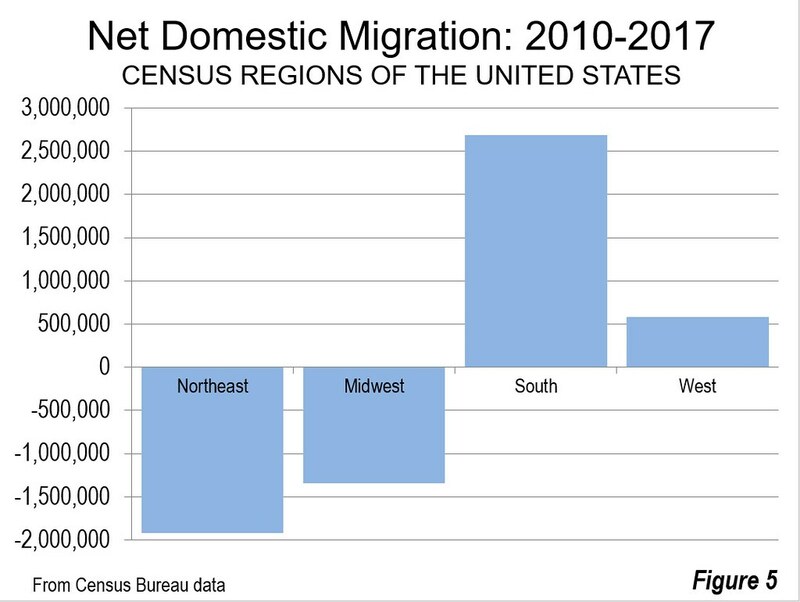 In the South, most states have been gaining domestic migrants, though there are exceptions, especially Maryland, Virginia, West Virginia and Mississippi. But overall the South has been dominant. 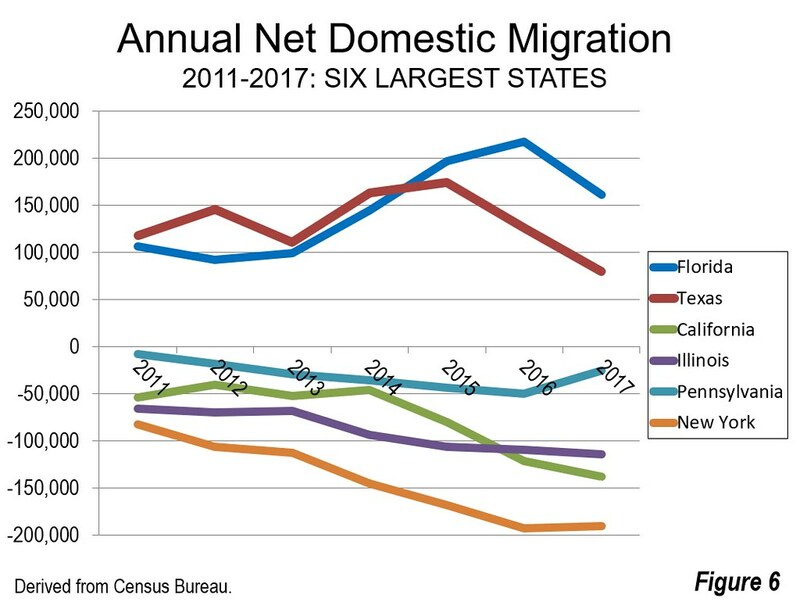 In each of the last seven years, the South has been the destination for more than 70 percent of US net domestic migration. Photo credit: David B. Gleason via Flickr under CC 2.0 license.